The cool, wet climate of Heart of Avalonia, combined with low levels of air pollution, yields a favorable environment for the growth of lichen on rocks. 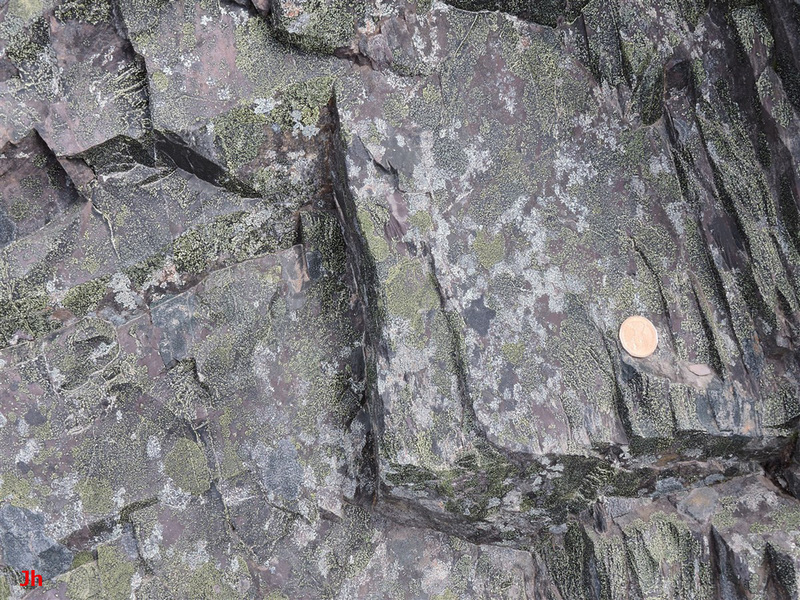 Freshly exposed rock surfaces can potentially be recognized by a relative lack of lichen coverage as compared with older surfaces exposed by past glacial/periglacial activity. 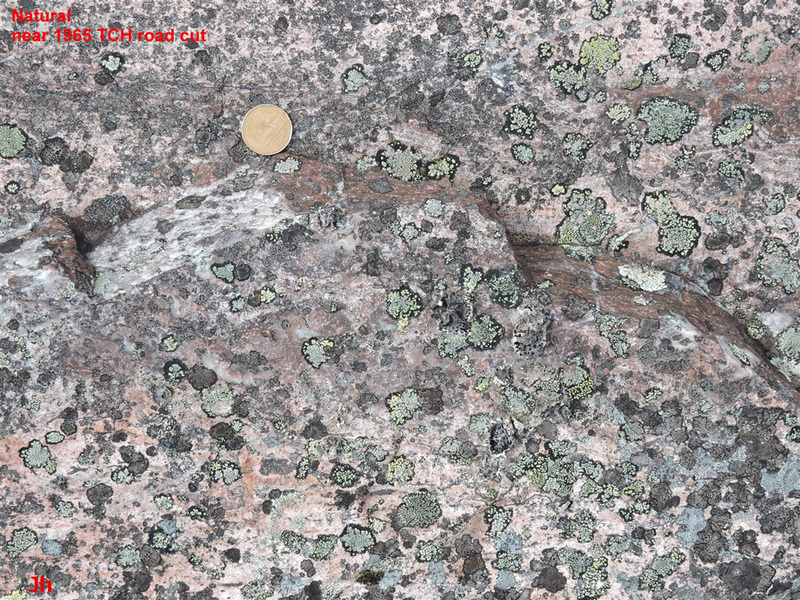 Lichenometry is a method for dating recent rock exposure events by measuring the growth and spread of certain lichens. 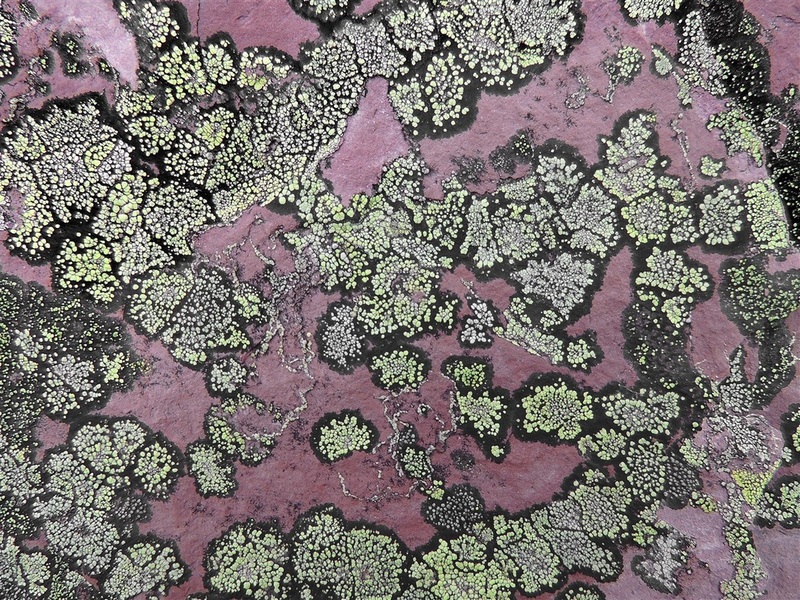 These lichens are presumed to have commenced growth at a determinable rate shortly after initial rock-surface exposure. 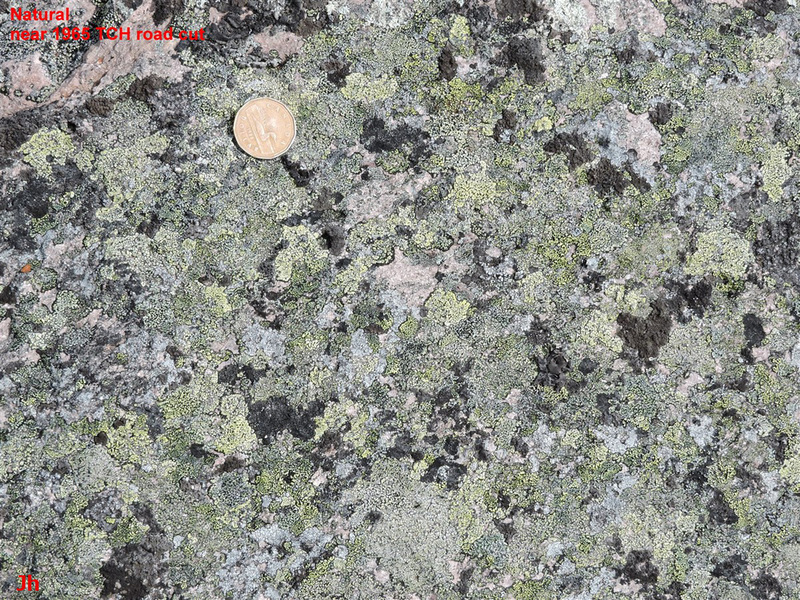 Lichenometry often makes use of the lichen, rhizocarpon geographicum, which is pictured below. ​It is not appropriate to attempt to use the methods of lichenometry in the current context. The method is best suited for dating events less than 500 years old whereas bedrock disruption events occurring under pre-Holocene climate conditions are more than 10000 years old. Nevertheless, abundant lichen coverage of particular rock surfaces can help rule out very recent exposure of those surfaces. This helps separate ongoing bedrock disruption processes from older glacial/periglacial processes that have halted under present climate conditions. The question to be addressed in this section is: How fast do lichen patterns change? 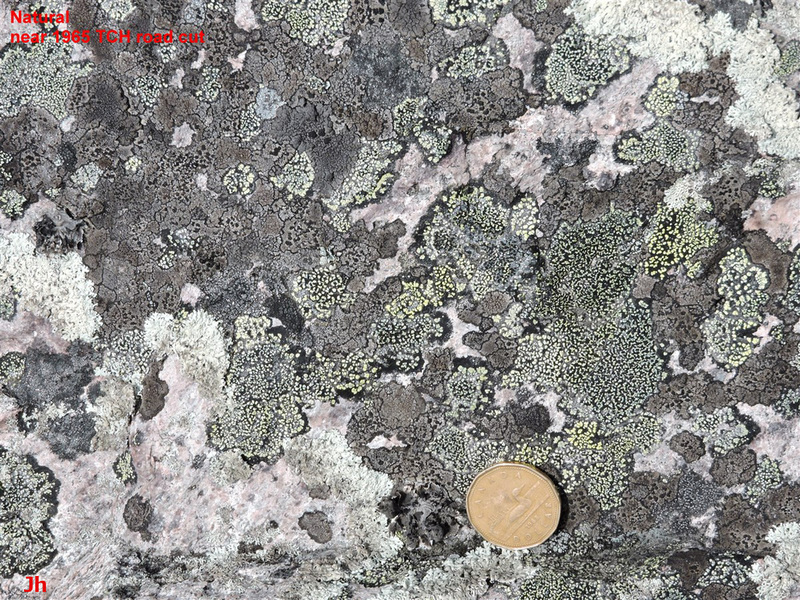 The answer, based on observations from Heart of Avalonia, is that changes appear to occur slowly enough that an undisturbed lichen pattern could point to as much as a century of non-activity on an exposed rock surface. The above photos show a frost-heaved joint block about 80 cm high. 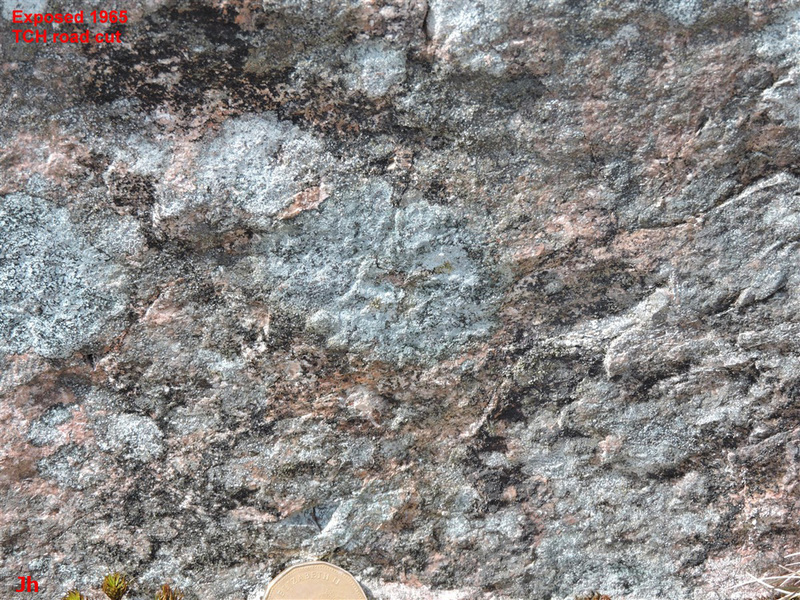 The rock is coated with a grey crustose lichen that has changed little over 6 years. The question here is: Is there any evidence that this block is being raised further by frost heave occurring in recent winters? 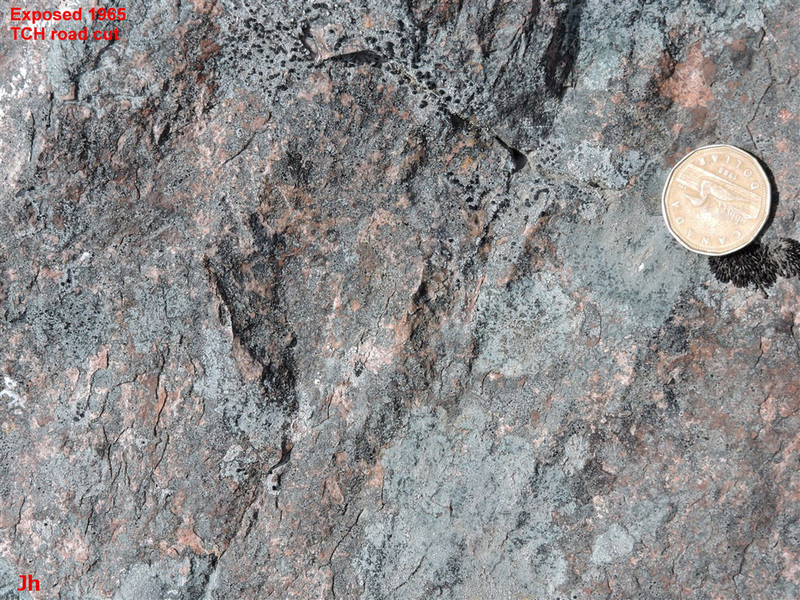 Although the bottom of the block appears to indicate a small amount of uplift, careful re-examination of this specimen in the field showed that the apparent uplift was a perspective effect in this particular pair of photos. 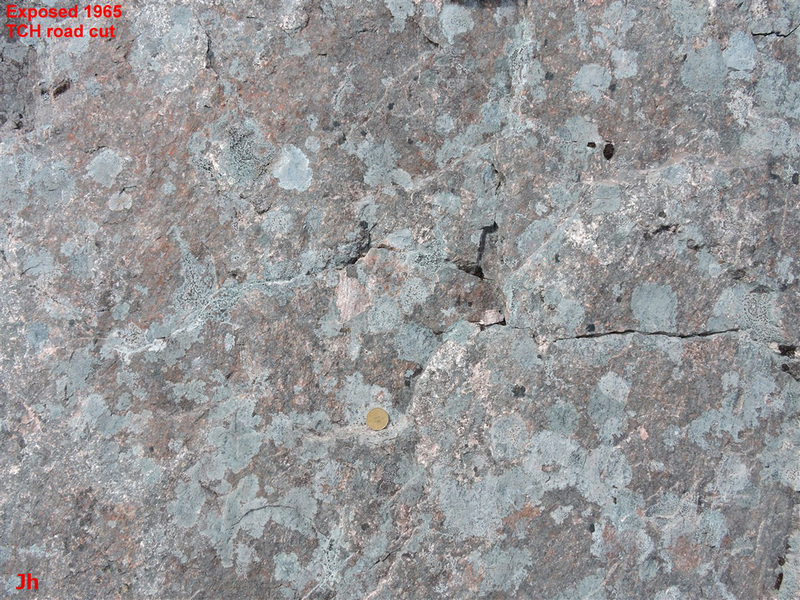 The white discoloration along the bottom of the rock is likely caused by contact with peat and vegetation at the base. 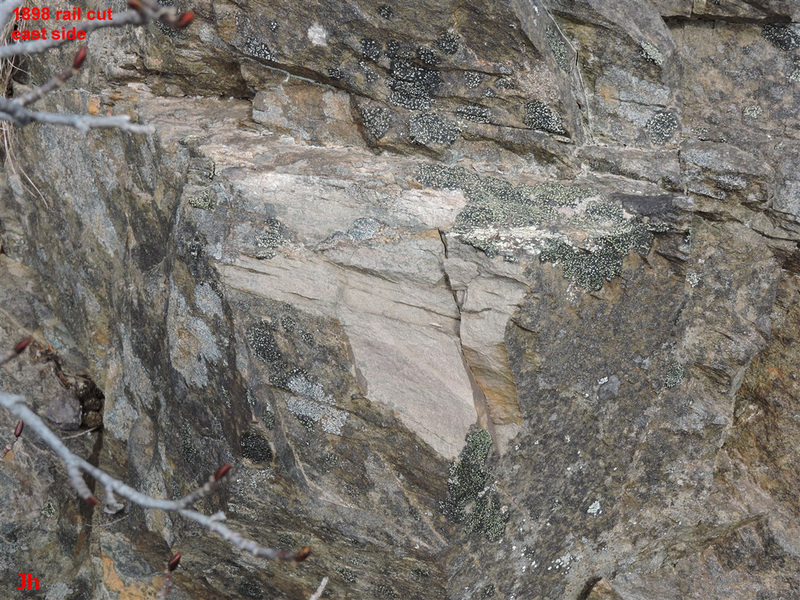 There is a deep hollow space under the entirety of this rock resulting from the rock's former upward displacement. This underneath space is free of water, is above the water table, and appears well drained. The conclusion here is that no recent uplift is occurring. 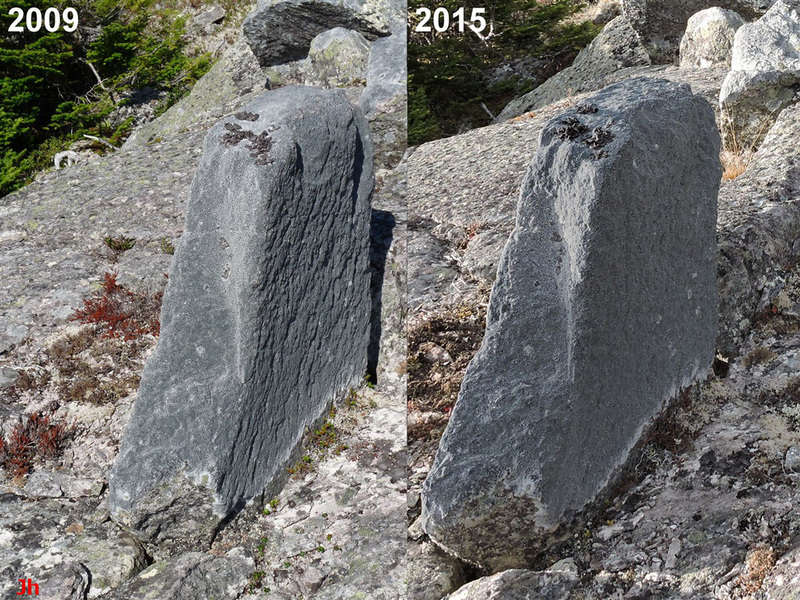 A granite erratic boulder about 3 m high was photographed to look for changes in lichen occurring during a time interval just over a decade long. The following two sets of photos show details of the surface. 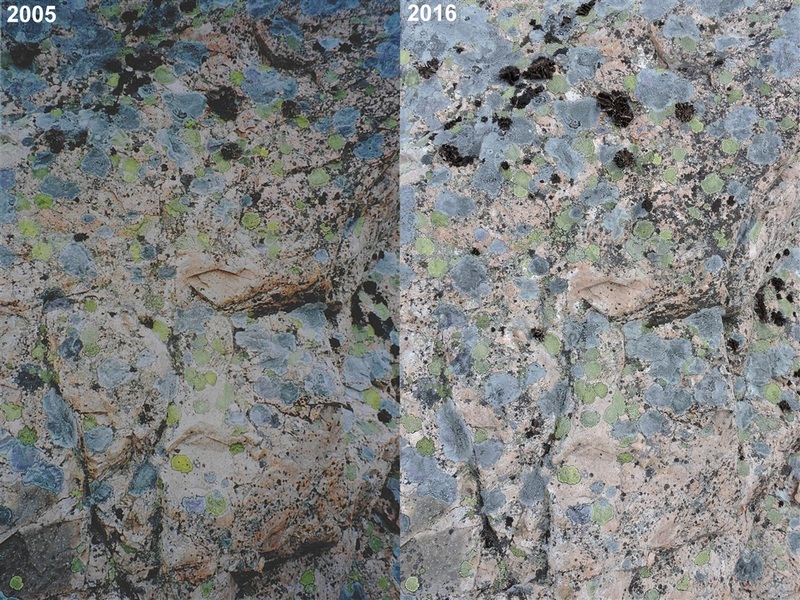 The above pictures reveal that, after a decade, there is little evidence of change in the lichen pattern on the exposed rock surface. 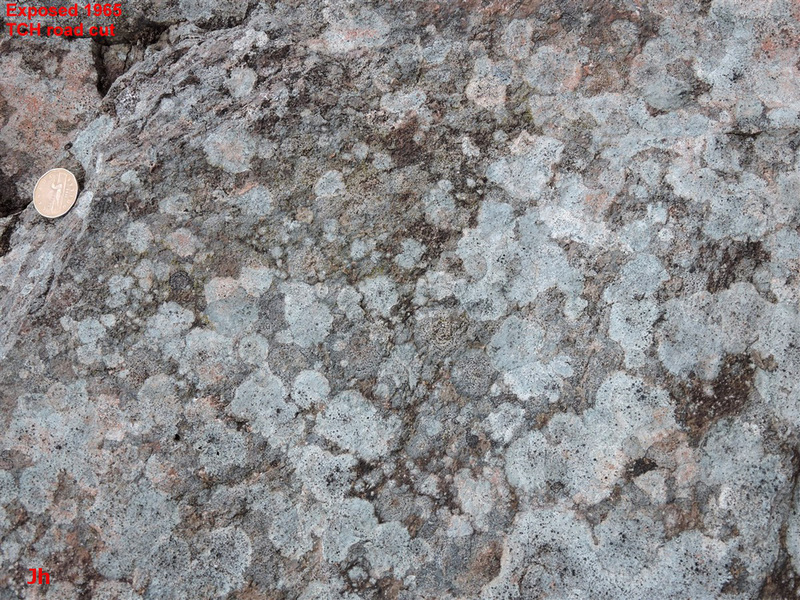 The continuity of the lichen pattern also indicates that negligible freeze-thaw weathering occurred on this rock during the 10 year interval. 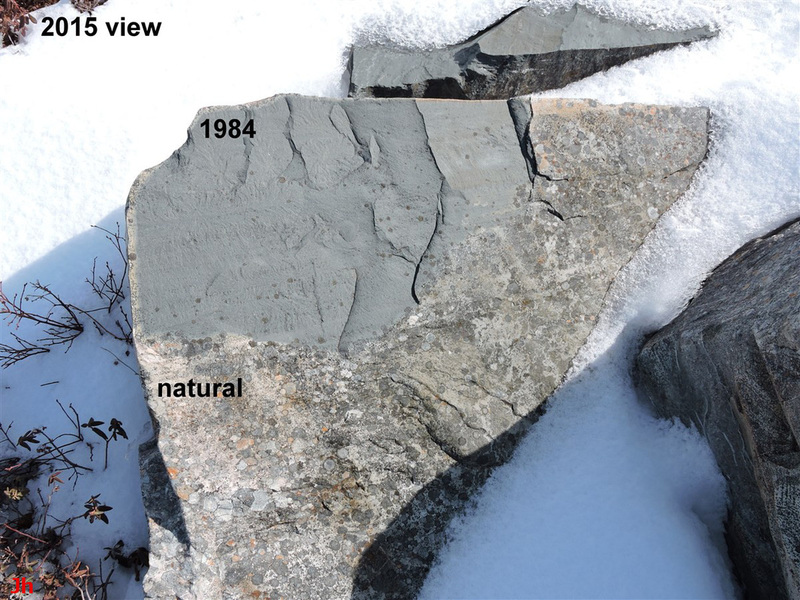 The above photo shows a bedrock outcrop that was fractured during installation of an electric transmission tower in 1984. 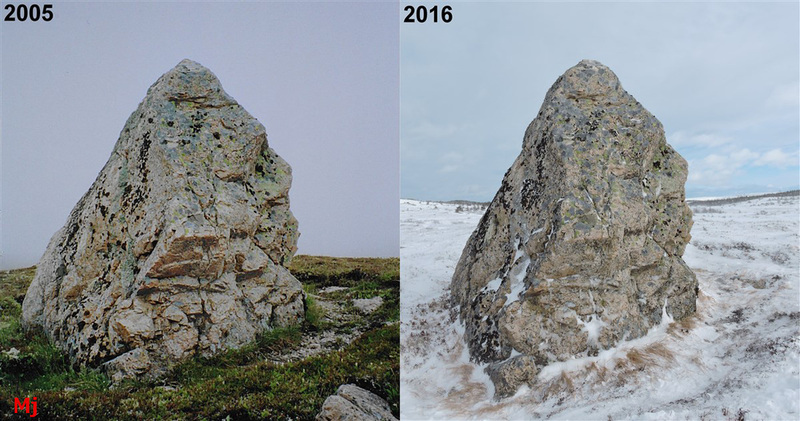 Some lichen growth can be noticed on the exposed surface, which was 31 years old when the picture was taken. A closeup is shown below. The coin is 2.5 cm in diameter. Another fresh surface, exposed in 1984 about 5 km further along the power line right of way, is pictured below. 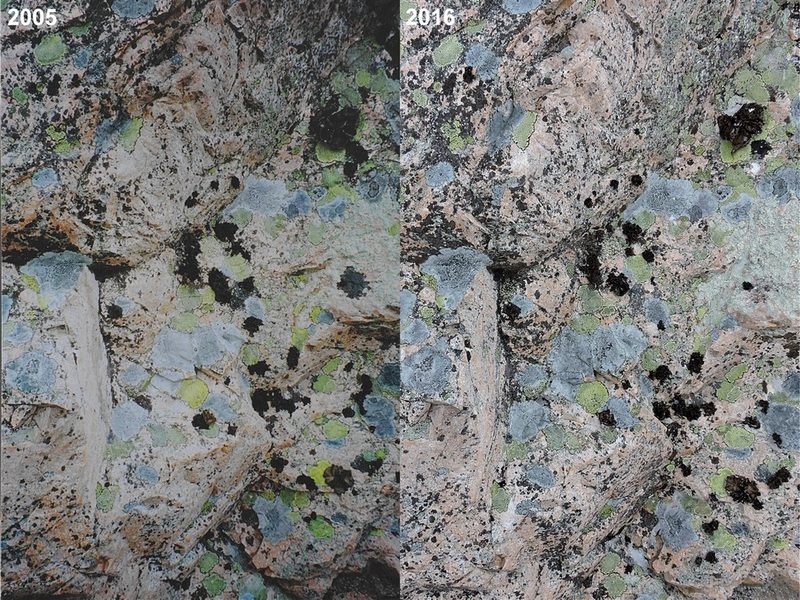 The extent of lichen growth over 31 years is similar to that shown at the previous location. 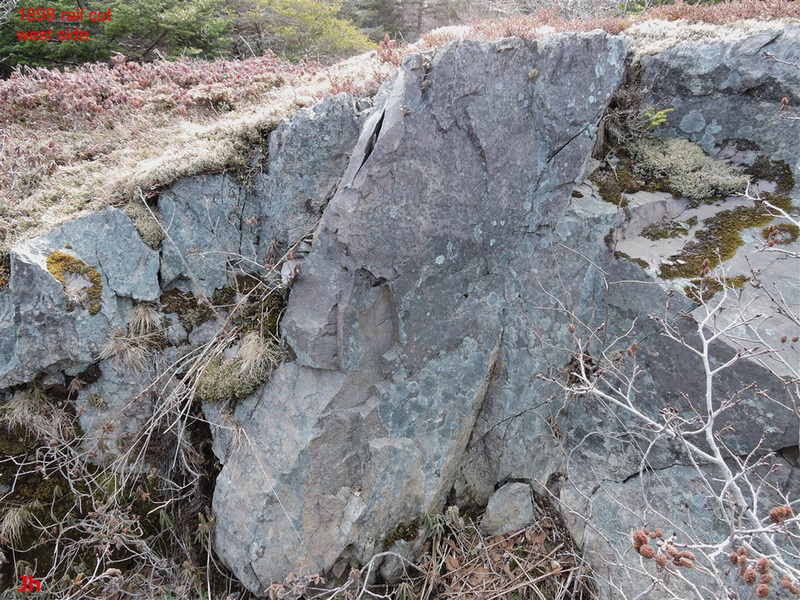 The following group of pictures shows bedrock surfaces from a road cut made for the Trans Canada Highway in 1965, then abandoned in 1984. The lichens growing on these rock surfaces were 51 years old when photographed in 2016. 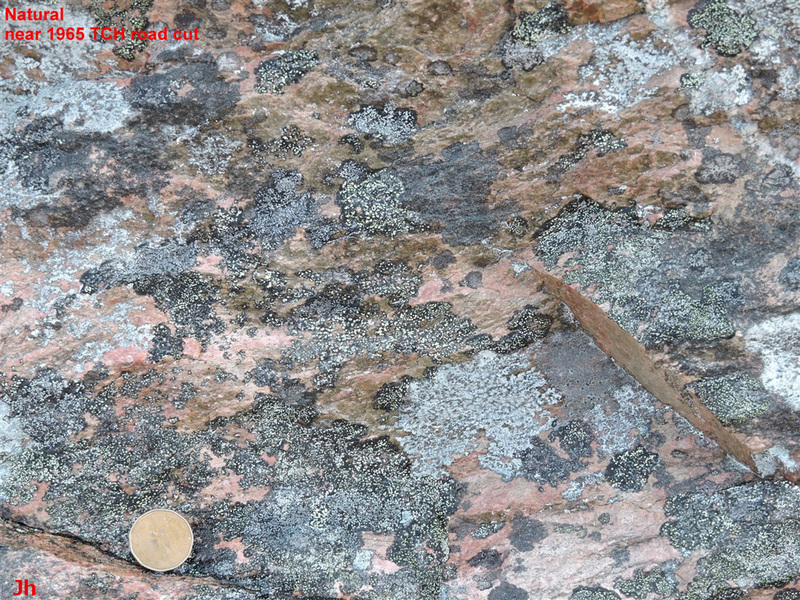 For purposes of comparison, the following group of lichen photos was taken on bedrock exposures and glacial erratics situated just above the road cut referenced above. 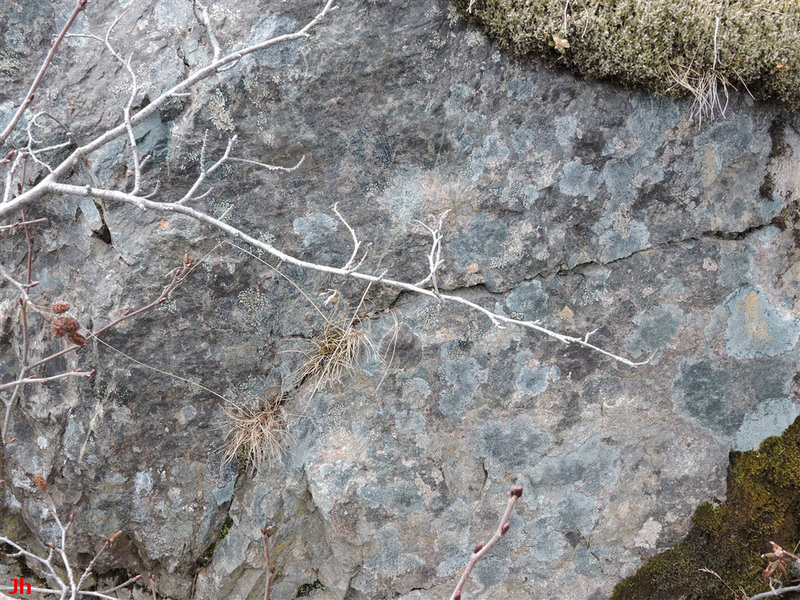 As shown in the first group of five photos, considerable lichen coverage can be established on rocks after a half century of exposure. 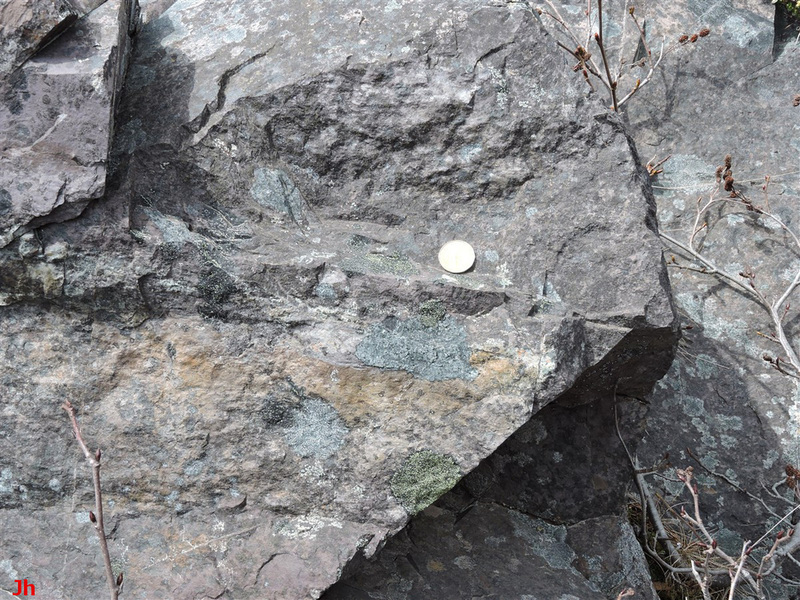 Nevertheless, there are differences in the appearances of the road-cut rocks and nearby rocks that have been exposed for a much longer time. 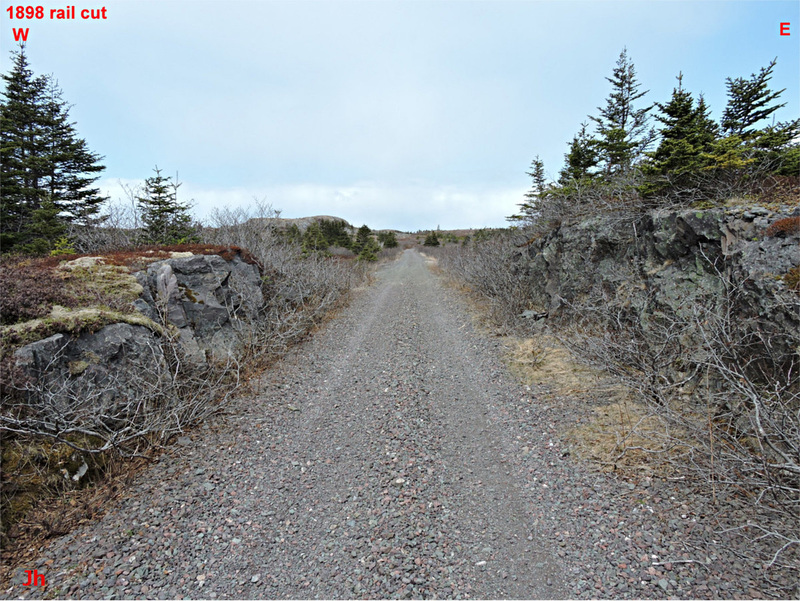 The longer-exposed rocks have more complete lichen coverage and more lichen diversity than the road-cut rocks. 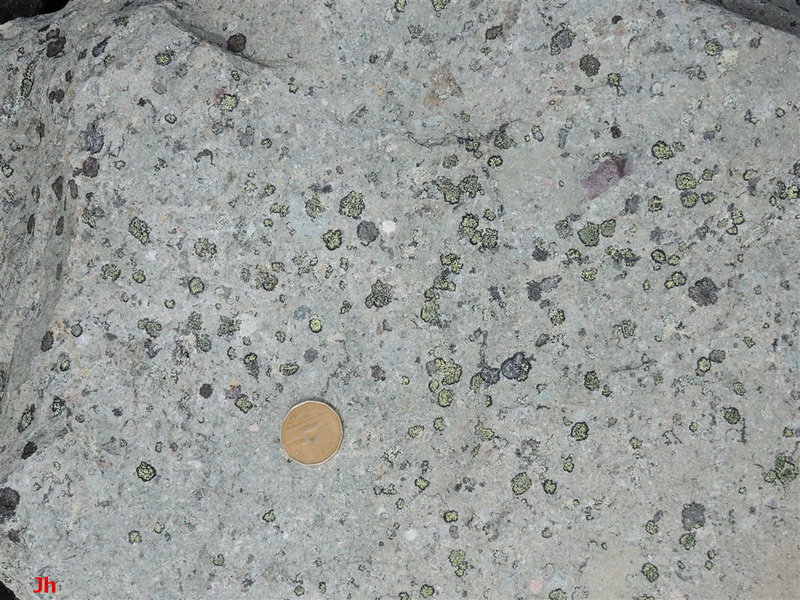 Rhizocarpon geographicum is much more predominant on the natural rock surfaces than on the 51 year-old surfaces. 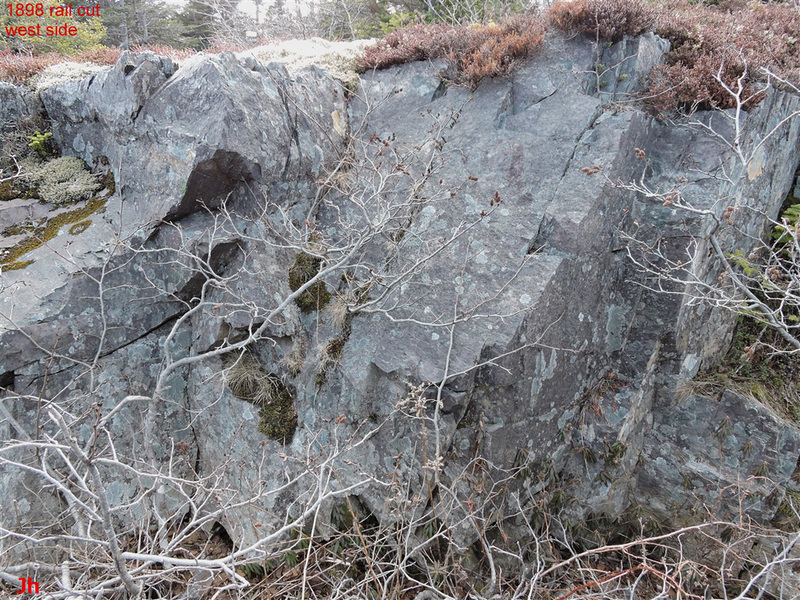 Proximity of the road-cut rocks to the highway for 19 years, before the highway was rerouted, might have inhibited growth of this particular lichen. In 1898, a narrow-gauge railroad was completed and placed in service, extending across the entire width of the Island of Newfoundland. The railroad was abandoned in 1988. 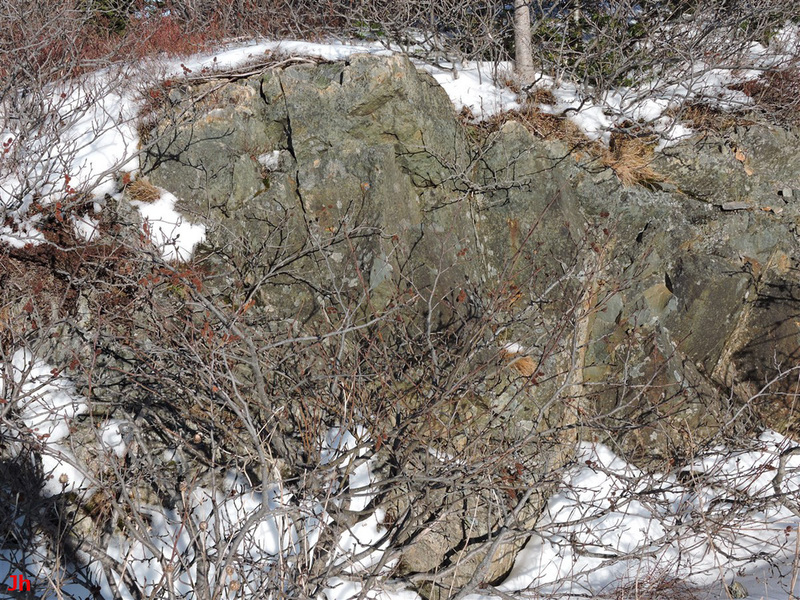 The above photo shows a rock cut along the railroad right of way. 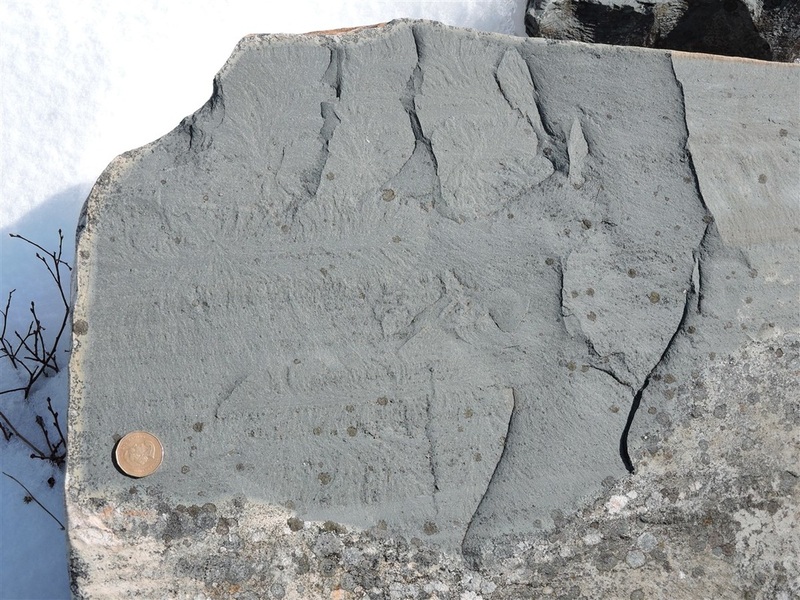 The exposed surface dates from before 1898 and was at least 118 years old when photographed in 2016. 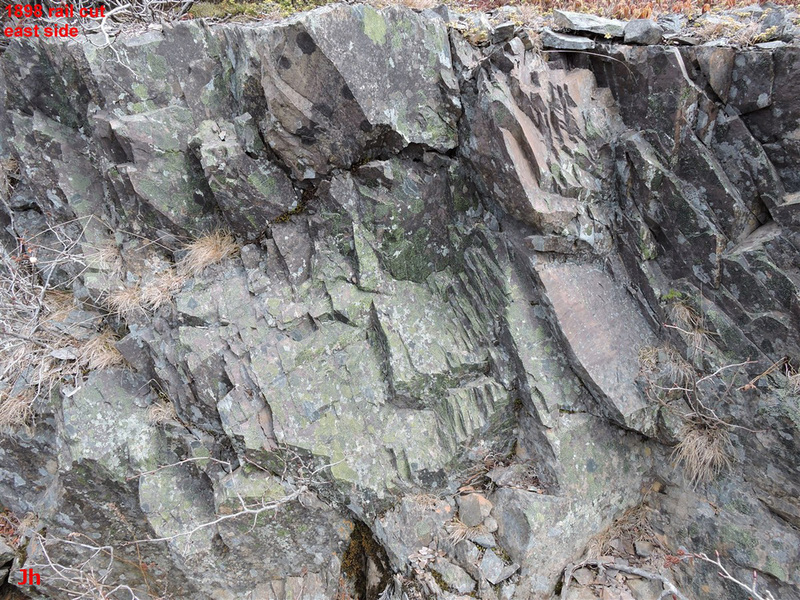 The rock is covered with lichen, but the density of coverage and number of types of lichen present makes this surface more closely resemble the 51 year-old road cut (above discussion) than natural, older surfaces. No nearby naturally-exposed rock surfaces were available for direct comparison. Another rock cut on the railroad right of way is pictured above. This view (looking north) is taken about 5 km north of the view shown in the previous photo. Lichen growth is different on the two sides, with much more rhizocarpon geographicum growing on the east (west-facing, right in photo) side of the rock cut. Closeups are shown below. 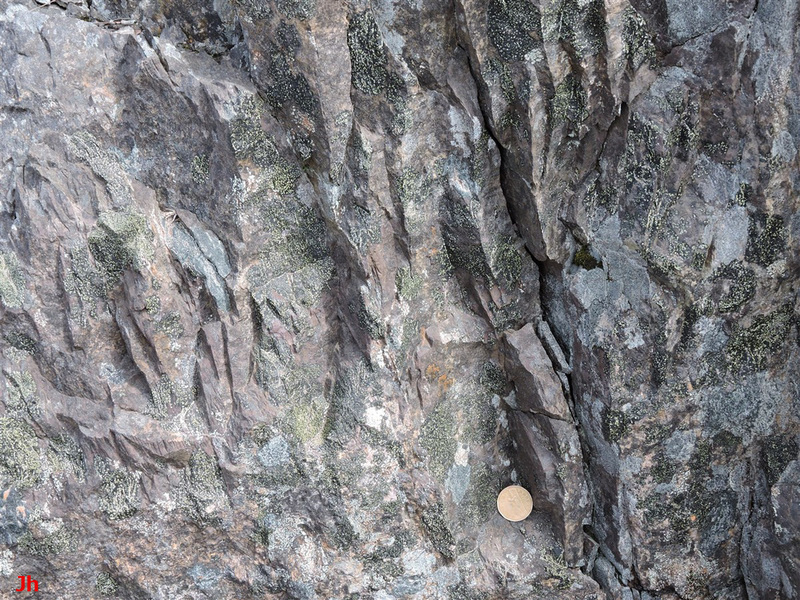 The pictures above show bedrock surfaces exposed over a century ago, their exposure time equaling about 1% of the time extending back to the beginning of the Holocene. 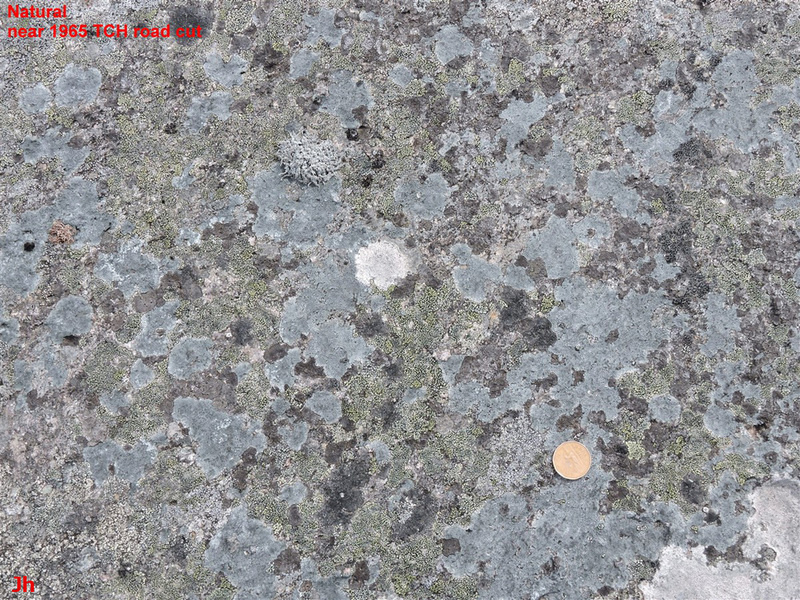 Although lichen coverage is substantial, many undisturbed bedrock surfaces in sunlit areas show more lichen and more diversity of lichen, giving such natural surfaces a recognizably different look from the disturbed surfaces shown above. Of course, there are frequent exceptions. 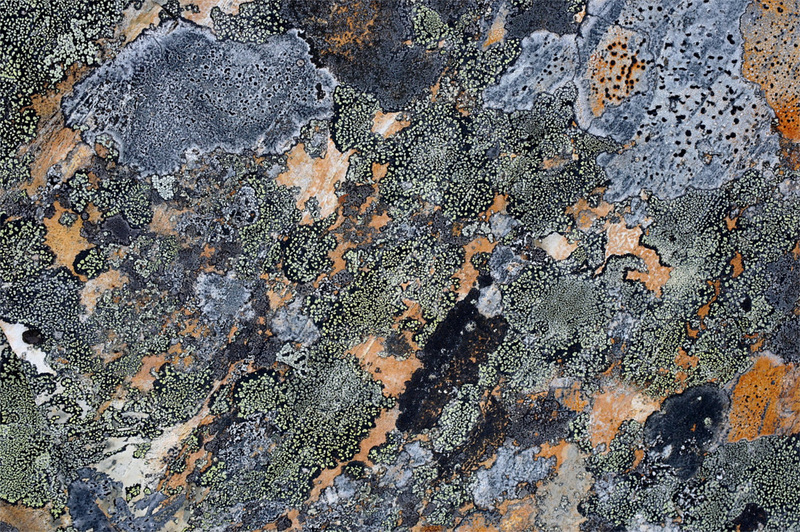 Lichens and moss can grow over other lichens, then deteriorate with age or harsh weather leaving behind a partially or totally stripped bedrock surface. Lichens do not grow well on some smooth rock surfaces and on surfaces heavily rinsed by rainwater runoff. 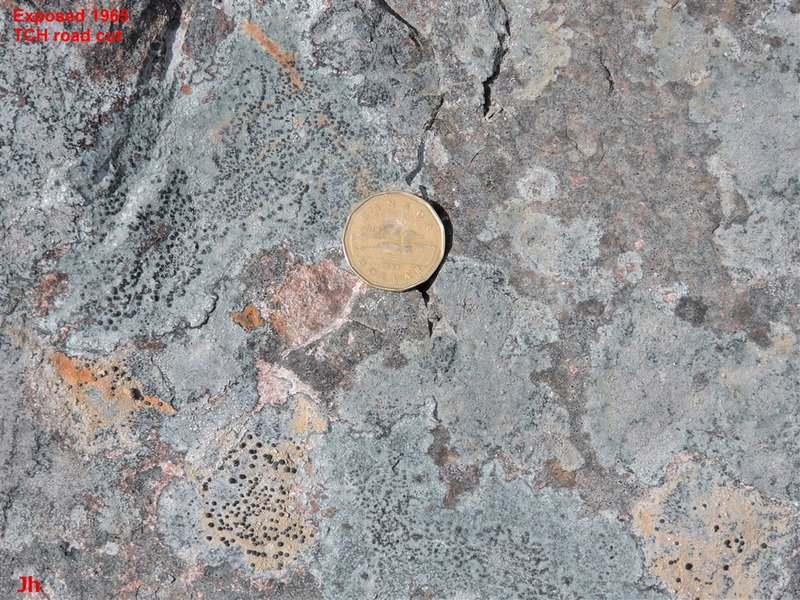 Undisturbed lichen patterns do not prove that rock surfaces date back to pre-Holocene times, and they can only faintly hint toward that conclusion. The section Lichen Applications discusses this in more detail.